ThinkGeek :: Tauntaun Sleeping Bag. This high-quality sleeping bag looks just like a Tauntaun, complete with saddle, internal intestines and glowing lightsaber zipper pull. 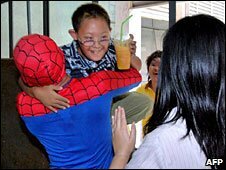 This entry was posted in Blather and tagged merch, reals, spider-man, star wars, superhero on April 06, 2009 by Dotan Dimet.